Right. I'm not doing a "Retro Game Club" again, until Shadowlink's "The ORIGINAL Classic Game Club" is done. I think he's starting this week-end, though. Next weekend. June 4. We had a few people for whom this weekendwas too early. Plus it will give me a chance to try and plan progression. I want to run it past the other veterans for their opinion. I'm a Turrican lover. With Metroid, Zelda and some other classics, it's one of my favorite series. I started in 1990 with Turrican on Amstrad CPC 464 (with the 15 to 45 mins loading tapes ! ), I was 7 years old (near 8) at this time. It was hard as hell and the framerate was very slow, but the game was fun : gigantic levels, lots of weapons, tons of secrets... then one year later, I played Turrican 2, on Amstrad CPC 6128 (with a disk system ! Boot the game in 4 seconds instead of half an hour ! ), the framerate was way better, the gfx too but the spirtes were too big and there were too many bugs. It was fun anyway. Until I discovered Turrican 1, 2 and, two years later, Turrican 3 on Amiga. Oh. My. God. It was a like being directly hit by a nuclear bomb. As you may already know, Turrican was born on Commodore 64, made by Manfred Trenz and four other people. Then they made Turrican 2 on C64, with Markus Siebold for the music. Factor 5 ported the games on Amiga with Chris Huëlsbeck and... it was a pure diamond. Turrican 3 is when Factor 5 and Rainbow Arts went crazy. Turrican 3 was made by two separated team of Factor 5 (and not with Manfred Trenz) and T3 on Amiga was a port of Mega Turrican on MegaDrive / Genesis. Anyway, even if this game is very linear, I loved this game (the Amiga version, only because of the almighty soundtrack the Genesis screwed). Manfred Trenz did, Super Turrican for NES, ALONE ! It was a big melting pot between the two first Turrican, with a lot of new things : now you can run (! ), there's no timer (!!) you can use the power lines in eight directions and it can make you invincible for 5 secs (!!!) and if you die, you restart from the beguinning of the level (!!!!) and there's 4 difficulty levels (and the last one is just pure madness). Despite the flaws (mainly on the music and the difficulty), it was a very nice 8-bit Turrican. And finally, the last forever (well, maybe not ! ), Super Turrican 2 on SNES, one of my beloved game, despite the fact that it's a linear game, unlike Turrican 2. The Turrican series have a long story, with (sadly) many conflicts between the original creator of Turrican (Manfred Trenz), THQ and Factor 5. If theres one thing Zero and I do, its agree about everything. 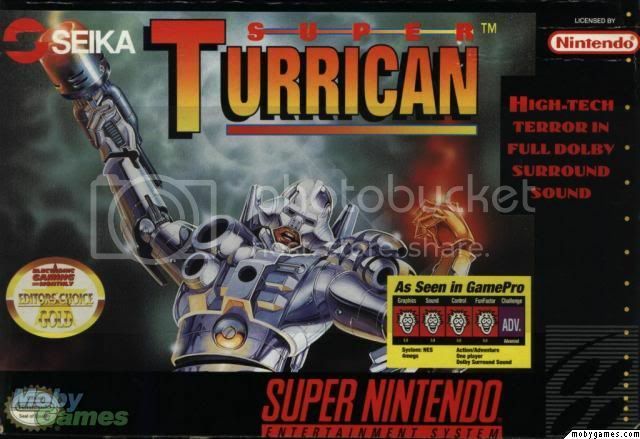 I played Super Turrican back when it was released on the SNES and I loved it! Mainly the music is the reason I kept playing this game! I even downloaded it on the VC when it became available. I owned a C64 and the Amiga but I will be honest, I had no idea that Turrican originated from the Commodore computers(silly me), esp. with all the games I had for those systems. Yea, I remember many winter days playing Super Turrican. IMO, a very well made game, even if those in the know say it doesn't stand up to it's Commodore counterparts. I thought ST was specifically developed for the SNES. I guess dad was right when he said you learn something new everyday. How do people have ANY free time? I don't understand it. I'll try to get on Super Turrican tonight. The lady and I beat Donkey Kong Country (1) in one sitting last night instead. 65%. 3:00+ hours. Its been a while. The lady and I beat Donkey Kong Country (1) in one sitting last night instead. 65%. 3:00+ hours. Its been a while. Why? Because its not under an hour? I don't know where the confusion lies. Thanks for dishing out the knowledge, there, Luther! Glad to see you dug ST2 despite the linearity, I believe I'll give it a shot. Have you played Mega Turrican at all? To be honest, I played Turrican on almost every system (but not ZX-Spectrum and another very old 8-bit computer). So yeah, I played Mega Turrican and bought it on Virtual Console. For the a TRUE Turrican made by Factor 5 on consoles, it's a big hit, with awesome graphics, nervous action, awesome controls, excellent music (despite the MegaDrive / Genesis terrible soundchip, the Amiga version - Turrican 3 - is wayyyy better). - Why, in the name of You-Know-Who, do you have to get a score with the last two digits on "00" (like 01234500) to get to the level 1-2 ? In the Amiga version, it's a normal level, not a hidden one, plus it's an awesome level ! - The second one, they removed the golden armor. To get it in T3, you have to find a secret at the beguining of the level 2-1. It avoid your weapons to decrease their power when you lose a life. - And the last one : there's no Maniac mode. Once again, in Turrican 3, there's four difficulty levels : Easy, Normal, Hard and Maniac. With Maniac, all the 1up are removed ! You only have 3 lives ! But hey, Mega Turrican is still a great game with much better graphics and controls ('cause now the grapple is binded on a button, you don't have to hold FIRE to start aiming the grapple... like in the Amiga version) ! EDIT 2 : The Final Fight : thanks for your welcome messages but I'm not a "new" member ! :). I even thought I was making great progress too at the beginning when I didn't use a continue until the last area of World 2. Anyway fun game so far. Challenging but not too unfair. Even the lightning and wind (which is really a nasty surprise to put at the beginning of the game) becomes manageable once you get used to the timing and visual cues. @Mr_Mustache You inferred that you had no free time while somehow finding time to play DKC for 3+ hours straight, duh. Ohhhhhhhhhhhhh. Well, *scoff* thats lady time! Thats like a bike date; you understand! For some reason I just can't get used to the visual cues. I mean, I can handle the wind, and I could probably handle the lightning too by itself, but not in addition to the wind. Yeah see what you mean. I'm confused after looking at their website. It talks about coming out for Neo-Geo and Dreamcast. Does that simply mean their doing versions for those particular console emulators? The Dreamcast homebrew scene is thriving, from what I understand, so it's not out of the question that they would attempt selling discs off their website, for instance. Neo Geo is a little bit more surprising. There were no NG flash carts as of two years ago. I'm too lazy and too scared about my Internet connection to dig deeper. Yeah, that game looks extremely Turrican. I'd play it.